Introduction: In older patients we documented the incidence of additional injuries in shoulder dislocations in a non-randomised, prospective study and compared the results of conservative and of operative therapy of rotator cuff tears. Material and methods: Between 1993 and 1999 a total of 87 patients were prospectively enrolled. In the case of documented tears of the rotator cuff in combination with symptoms persisting after conservative therapy patients were free to decide between surgical and conservative treatment. Patients were monitored for function, subjective stability, and satisfaction over a minimum follow-up period of 1 year. Results: In 54% of the patients enrolled a cuff tear was documented; the frequency increased with advancing age to 100% in patients over the age of 70. Surgical treatment of the cuff tears resulted in better function and satisfaction. There were three recurrences in the conservative treatment group, while no recurrences were documented in surgically treated patients. The significant benefit of cuff repair was confirmed by regression analysis. 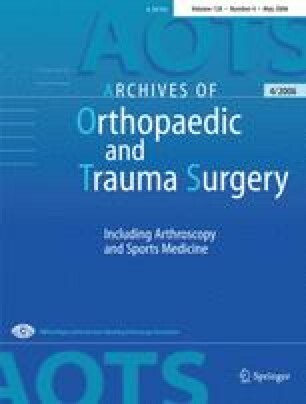 Conclusion: In this selected patient group, we believe surgical repair of the symptomatic rotator cuff tear should be discussed with the patient.